Dosto Maine Apne Pichhle Post Me Jio Ka Retailer Kaise Bane Iske Baare Me Bataye The Aur Aapme Se Bahut Se Log Jio Retailer Ke Liye Apply Bhi Kiye Honge. To Dosto Unme Se Bahut Saare Logo Ko Jio Retailer Ka ID Mil Gye Honge To Aap Ye Jarur Soch Rahe Honge Ki Ab Aage Ki Process Kya Kare. To Chaliye Dosto Ham Aapko Batayenge Ki Aage Ki Process Me Kya Karni Hai. 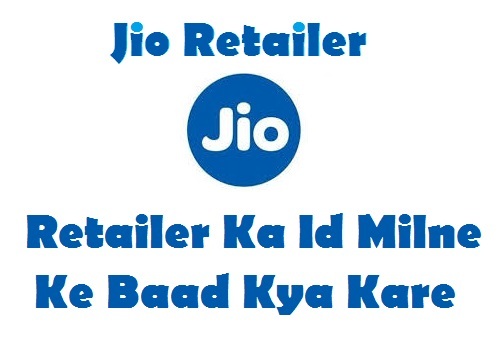 Jio Retailer Id Milne Ke Baad Kya Kare? Dosto Aapko Jio Retailer ID Ka 2 Tarh ID Mila Hoga Yaani Ki Aapko 2 Id Mila Hoga. Ek Aapko 62........ Waala Mila Hoga Aur Dusra Aapko 068........ Wala Mila Hoga Saath Me Aapko Password Bhi Diye Honge. Dosto Jio Sim Activation Karne Ke Liye Aapko Three Android Application Download Karni Hogi. Jiska Name & Download Link Niche Me Diye Gye Hai. Dosto Jio POS Plus Aapko Plus Store Me Nahi Milega Aapko Official Site Se Download Karna Hoga Aap Google Me Search Kar Download Kar Sakte Hai. Jio Pos Puls Ka Latest Version 11.05 Hai. AirWatch Agent Aur Morpho SCL Driver RD Service Aapko PlayStore Me Mil Jaayega. Ye Three App Apke Android Mobile Me Install Hona Chahiye. Tabhi Aap Login Ho Payenge Aur SIM Activation Kar Payenge. Dosto In Three Latest Version Aaplication Ko Install Kar Le. Bas Dosto Jio Ka Retailer ID Milne Ke Baad Aap Logo Ko Itna Hi Kaam Karna Padega Ye Three Android Aap Istall Ho Jaane Ke Baad Aapko AirWath Agent Aur Jio Pos Me Login Karna Padega. Dosto Yadi Aapne Bhi New ID Liye Hai To Mera Next Post Jarur Pade Kyoki Usme Main Bataunga Ki Jio Pos Aur AirWath Me Login Kaise Karte Hai. Dosto Yadi Aap Jio Pos Aur AirWath Me Login Nahi Kar Pa Rahe Hai To Niche Comment Jarur Kare Taki Ham Aapko Login Kaise Karte Hai Batayenge. Dosto Ye Post Aapko Achchhe Lage To Aage Apne Dosto Ko Aur Social Media Me Share Jarur Kar Dena. Dosto Yadi Jara Si Bhi Hamare Blog Se Aapko Help Milta Hai To Aap Hamare Blog Me Email Se Subscribe Jarur Kare Taki Hamare Latest Post Sidhe Aapke Email Me Pahuchega Aur Sath Hi Facebook Page Ko Like Karna Na Bhule.